Conservatories can be a stylish addition to almost any home, is yours next? They’re often associated with summer, but they can be used with comfort all year around thanks to the amazing insulating qualities of UPVc and glass, which makes up all the backbone of all of our conservatories. The Equinox tiling system offers a wide range of benefits, including improving thermal efficiency, and lowering noise levels. 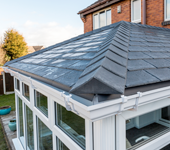 This system can also revitalise old roofs, and is compatible with all conservatories. Bring the many benefits of natural light into any room with a Skypod. 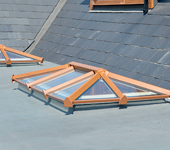 These skypods can be used on flat roofs, and are available in a choice of glass options. With a sleek design and a 10 year guarantee, these skypods are timeless. For a more traditional design, Edwardian Conservatories are ideal. Classic, clean lines, a wide range of sizes, and a universal design offer a bold conservatory solution that’ll suit most homes. 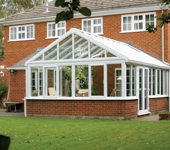 Another traditional design, the Victorian conservatory is available as a three or five face roof configuration. The traditional design doesn’t compromise on energy efficiency or quality of build, however. Mimicking the gable end of an average house, a Gable End conservatory offers you as much space and natural light as possible. This design is available in a range of sizes up to 6m x 6m, and is available in a wide choice of colours and woodgrain finishes.